These costs are provided for a full year (two semesters) of study at John Carroll. *Amount for a standard double room and meal plan. Room and board rates vary based on building, room type and meal plan. 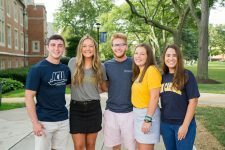 **Students are required to live on campus during their first two years unless they live in the primary residence of their parents and/or guardian, which must be located within 35 miles of JCU.